The Foundation for Landscape Studies is pleased to announce the winners of the 2014 John Brinckerhoff Jackson Book Prize for recently published books that have made significant contributions to the study and understanding of garden history and landscape studies. The winners are listed in alphabetical order. California has more trees now than at any time since the late Pleistocene. This green landscape, however, is the work of history, not nature. In the years after the Gold Rush, American settlers remade the California landscape, harnessing nature to their vision of the good life. Horticulturists, boosters, and civic reformers began to alter the bare, brown countryside, planting millions of trees to create groves, wooded suburbs, and landscaped cities. They imported the blue green eucalyptus whose tangy fragrance was thought to cure malaria. They built a lucrative industry on the sweet juice and thick skin of the Washington navel orange. They lined their streets with graceful palm trees. Yet California’s new landscape proved to be no paradise. By 1900 timber firms owned the entire redwood forest; by 1950 they had clear-cut almost all of the old-growth trees. The eucalyptuses in the Berkeley hills exploded in fire; the orange groves near Riverside froze on cold nights; Los Angeles’s palm trees harbored rats and dropped heavy fronds on the streets below. Disease, infestation, and development all spelled the decline of the nonnative redwood. In the north, however, a new forest of second-growth trees took root, nurtured by protective laws and sustainable harvesting. Today there are more California redwoods than there were a century ago. Trees in Paradise chronicles the history of the making of California verdant from roots to canopy. Rich in character and story, it is a compelling narrative that offers a new and insightful perspective on the history of the Golden State and the American West. 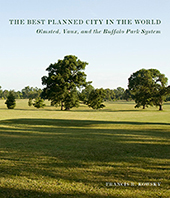 Beginning in 1868, Frederick Law Olmsted and Calvert Vaux created a series of parks and parkways for Buffalo, New York, that drew national and international attention. The improvements augmented the city’s original plan with urban-design features inspired by Second Empire Paris, including the first system of “parkways” to grace an American city. Olmsted and Vaux dissolved their historic partnership in 1872, but Olmsted continued his association with the Queen City of the Lakes, designing additional parks and laying out important sites within the growing metropolis. When Niagara Falls was threatened by industrial development, he led a campaign to protect this scenic treasure, and in 1885 he succeeded in persuading New York to create the Niagara Reservation, the present Niagara Falls State Park. Two years later, Olmsted and Vaux teamed up again, this time to create a plan for the area around the falls. Francis R. Kowksy illuminates this remarkable constellation of projects, utilizing plans, drawings, photographs, reports, and letters. He brings a new perspective to the vast undertaking, analyzing it as a cohesive expression of the visionary landscape and planning principles that Olmsted and Vaux pioneered. George Washington believed that character was inextricably linked to morality and social concerns. His house, gardens, and art collection – and his writings about them – reflected his desire to serve as an exemplar of this philosophy as well as his need to live a rational, tranquil, and harmonious life. 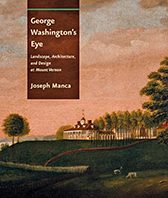 In examining how Washington’s values shaped the material culture of Mount Vernon, art historian Joseph Manca offers a complete picture of its moral, stylistic, and historical attributes. He examines the man behind its design, portraying a statesman who was deeply influenced by his wide travels throughout colonial America; a connoisseur who had broad architectural knowledge and an informed aesthetic philosophy. Based on a careful study of Washington’s diaries and correspondence and the lively accounts of visitors, this richly illustrated book introduces a side of the Founding Father unfamiliar to many readers – the avid art collector, amateur architect, and, along with Thomas Jefferson, the leading landscape designer of his time. In Unearthed Karen M’Closkey uses Hargreaves Associates’ portfolio to illustrate the challenges and opportunities of designing public spaces. 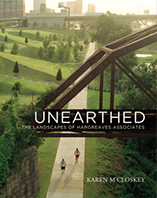 Founded by George Hargreaves in 1983, this landscape architectural firm has transformed numerous abandoned sites into topographically and functionally diverse parks. Its body of work reflects the socioeconomic and legislative changes that have impacted landscape architecture over the past three decades. The firm’s longstanding interest in transforming industrial sites has necessitated frequent contact with communities and local authorities. As political, social, and economic terrains, these landscapes offer the opportunity to reflect on larger issues in urban redevelopment. Illustrated with more than one hundred and fifty color and black-and-white images, this groundbreaking scholarly examination of the firm’s philosophy and body of work explores the methods behind such projects as San Francisco’s Crissy Field, the Louisville Waterfront Park, the 21st Century Waterfront in Chattanooga, Tennessee, and London’s 2012 Olympic Park. M’Closkey outlines how Hargreaves and longtime associate Mary Margaret Jones approach the design of public places – conceptually, materially, and formally – on sites that require significant remaking to support ecological and social needs. 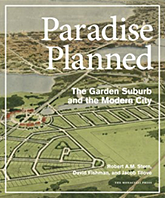 Paradise Planned is the definitive history of the development of the garden suburb, which originated in England in the late-eighteenth century, was quickly adopted in the United States and northern Europe, and gradually spread throughout the world. Such neighborhoods promised a bucolic lifestyle, typically outside a city, but accessible by streetcar, train, and automobile. Today the principles of the garden-city movement are once again in play as the retrofitting of suburbs has become a central issue in planning. Strategies are emerging that reflect the original goal of the garden suburb: the creation of a metropolitan community that embraces both the intensity of the city and tranquility of nature. Paradise Planned is the comprehensive, encyclopedic record of this movement, a vital contribution to architectural and planning history, and an essential resource for guiding the repair of the American townscape.